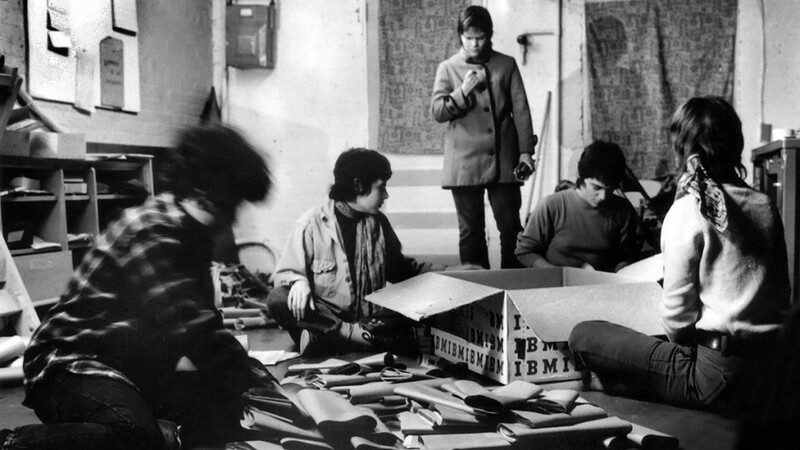 Members of the Washington, D.C. Furies Collective, a group of political lesbians, are packing and distributing their newspaper in 1972 at 219 11th Street SE, Washington, DC. Left to right: Ginny Berson, Susan Baker (not a Fury), Coletta Reid, Rita Mae Brown, Lee Schwing. Photo: via National Trust for Historic Preservation | © Joan E. Biren. There is an unassuming brown brick row house with white columns and blue trim 219 11th St SE on Capitol Hill. But in January 2016, the seven-member board of the D.C. Historic Preservation Review Board voted unanimously to designate the house as an LGBT historical landmark on the D.C. Inventory of Historic Sites. The building’s claim to that nomination dated from the early 1970s when it was headquarters for the lesbian feminist group known as the Furies Collective. Twelve young white women lived communally there, sleeping in a common room, sharing household duties and care of the commune’s three children. They taught classes in self-sufficiency for neighborhood women and published a newspaper, The Furies. The collective only endured for three years, but its voice was far reaching, and the member’s names are still icons of lesbian history. Rita Mae Brown, Susan Hathaway, Charlotte Bunch, and Joan E. Biren were the most notable. Their influence is still controversial today. The Furies was the origin, some say, of political lesbianism, which is not about sexual or romantic attraction to women, but instead about separating women from men entirely. The idea is not popular in today’s feminist circles, being mostly a way for straight women to appropriate space in the lesbian community. That controversy, however, has not dulled the interest in the house where such intense debate originated. Mark Meinke, the LGBT history advocate who presented the Furies House to the review board, says that the National Register of Historic Places is eager to add the house to their lists as well. He and Joan E. Biren have already called for the D.C review board to forward a nomination to the National Park Service. The current owner of the house, Robert Pohl, bought it unaware of its history, but has been an eager participant in the process of elevating it to these registries.